The Pac-12 Conference will honor 11 former student-athletes and one former head coach with their induction into the Pac-12 Men’s Basketball Hall of Honor. The individuals to be inducted are: Fred Snowden (Arizona), Ron Riley (Arizona State), Sean Lampley (California), Jim Davis (Colorado), Anthony Taylor (Oregon), Jim Jarvis (Oregon State), Casey Jacobsen (Stanford), Dave Meyers (UCLA), Alex Hannum (USC), Danny Vranes (Utah), Jon Brockman (Washington) and Bennie Seltzer (Washington State). "As a Conference, we have produced some of the most prolific players and best coaches the game has ever seen," said Pac-12 Commissioner Larry Scott. "We are thrilled that this class once again displays the success and rich heritage of Pac-12 men's basketball." Known for his high-octane offense and remembered as a trailblazer, Fred “The Fox” Snowden brought excitement to Arizona basketball during his 10-year tenure as the program’s head coach. 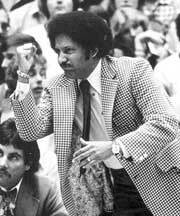 Snowden, who led the Wildcats from 1972-82, was the first African-American head basketball coach at an NCAA Division I institution, amassing a 167-108 mark. The 1973 Western Athletic Conference Coach of the Year, his career winning percentage of .607 has been topped by only three UA coaches since 1924. Nicknamed “The Fox” due to his cool demeanor, Snowden led Arizona to three postseason berths, including the 1975 National Commissioners’ Invitational Tournament and the 1976 and 1977 NCAA Tournaments. His best season came in 1976, when the Wildcats went 24-9, won the Western Athletic Conference championship and advanced to the NCAA West Regional Final. The Brewton, Ala., native was the head coach who led Arizona into the Pac-10 in the 1978-79 season, guiding the program for its first four seasons in the Conference. Snowden also oversaw the transition into the McKale Center after its opening in 1973. He was inducted into the Arizona Sports Hall of Fame in 1988. Prior to his role at Arizona, Snowden was an assistant coach at Michigan. He also served on the coaching staff of his high school, Northwestern High School in Detroit, Mich., where he coached for five years after attending Wayne State University from 1954-58. Snowden passed away in 1994 at the age of 57. A native of Las Vegas, Nev., and graduate of Clark High School, Riley finished his career as Arizona State’s leading career scorer with 1,834 in his four years as a Sun Devil. He played in 116 straight contests without missing a game, starting 109. 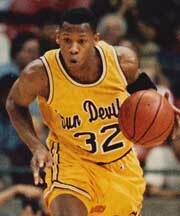 He began his career with ASU as the top freshman scorer in the Pac-10 in 1992-93, and was named to the All-Freshman Team by the league’s coaches. Riley was then the leading scorer in Arizona State’s three NCAA Tournament games in 1994-95 as he led the Sun Devils to their first Sweet Sixteen appearance in 20 years. His senior campaign in 1995-96 saw him average 20.1 points per game, the best single-season scoring mark by a Sun Devil since Byron Scott averaged 21.6 in 1982-83. At the time of his departure, Riley was the only player in ASU history to record at least 1,600 points, 500 rebounds (579) and 200 steals (202) in his career. He spent 10 years as a professional basketball player, playing for various teams in multiple minor leagues including the Continental Basketball Association and the American Basketball Association, before retiring in 2005. Since his retirement, Riley has served as an assistant college basketball coach at the University of Great Falls in Montana, while earning a degree in psychology and social work and becoming a qualified mental health counselor. He is also founder and president of Team Riley Training LLC, which provides services for youth to improve their skills on the court and become successful student-athletes. 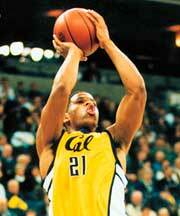 Lampley finished his career as Cal’s all-time leading scorer with 1,776 points under his belt. Upon his graduation, he was the only player in school history to rank among the school’s top 10 in scoring (first), rebounding (fourth) and assists (10th). Lampley was named Pac-10 Player of the Year in 2001 after averaging 19.5 points and 7.2 rebounds per game in his senior campaign, also earning AP All-America honorable mention accolades. In his sophomore season, he led Cal to the 1999 NIT Championship and was selected as the tournament’s Most Valuable Player. Following his departure from Cal, Lampley was drafted by the Chicago Bulls in the 2001 NBA Draft, going in the second round as the 44th-overall pick. He spent seven years as a professional player, playing for the Miami Heat and the Golden State Warriors in the NBA and also for multiple minor-league teams, both internationally and in the United States, wrapping up his professional career in 2009. A three-year letterman under the legendary Sox Walseth, Davis was a two-time first-team All-Big 8 honoree in his career with the Buffs. He scored 1,110 career points, which still ranks 25th on CU’s all-time list, averaging 14.4 points and 11.2 rebounds per game with a .489 shooting percentage. Davis led the Buffs to a 53-24 record in his three years in Boulder, winning two Big 8 titles and earning two berths to the NCAA Tournament. He is also one of the few players in school history to average a double-double for two-consecutive seasons, with 13.8 points and 12.7 rebounds per game as a junior followed by 18.5 points and 12.7 rebounds per game in his senior season. 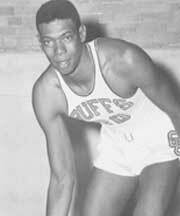 At the time of his graduation, Davis was CU’s all-time leading rebounder and third all-time scorer. Davis was a fourth-round selection by the Detroit Pistons in the 1964 NBA Draft, and eventually signed as a free agent with the St. Louis Hawks in 1967. He played eight seasons in all, scoring a total of 3,997 points in his career. Taylor concluded his Oregon career as the school’s second-leading scorer of all time with 1,939 points, which was seventh on the Pac-10’s career list at the end of his senior season. He is one of just 13 Ducks to ever lead the league in single-season scoring after averaging 21.3 points per game as a senior in 1987-88, when he led Oregon to a 16-14 record and the second round of the National Invitation Tournament. Taylor is also one of only four players in school history to lead the team in scoring in three different seasons. He was named to the 1987 Pac-10 All-Tournament team after leading the Ducks to wins over USC and Arizona before falling in the semifinals. The Beaverton, Ore., native represented the United States in the 1987 World University Games and was drafted in the second round of the 1988 NBA Draft by the Atlanta Hawks before playing one year with the Miami Heat. The four-year letterman, who played at Oregon from 1985-88, still ranks in the UO career top-10 in scoring, field goals made, free throws made and steals. Jarvis was a three-year letterman for the Beavers from 1963-65, where he helped Oregon State reach the NCAA Tournament twice. In his first year at OSU, as a sophomore, Jarvis helped the Beavers go 22-9 and reach the NCAA Final Four, one of just two teams in program history to do so. As a junior, he averaged 13.9 points per game as Oregon State finished the year 25-4 with another NCAA Tournament appearance. Jarvis then led OSU in scoring as a senior, averaging 21.1 points per game while receiving All-American and All-AAWU Conference honors. He finished his three-year career as fourth on the school’s all-time scoring list with 1,142 points, which is now the 26th highest total in Beaver history. 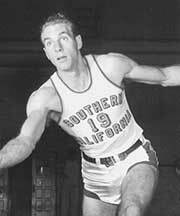 He was also the 1964 Far West Classic MVP and was a 1963 All-Tournament selection. After his graduation, the Roseburg, Ore., native was drafted by the San Francisco Warriors in the 1965 NBA Draft and played for two years in the ABA, winning the 1968 ABA Championship as a member of the Pittsburgh Pipers. Upon retiring from playing, Jarvis became the basketball coach at Spokane Falls Community College in 1971, then took over as the head coach at the University of Idaho. 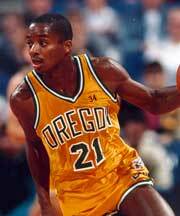 In the early 1990s, he served as a color analyst for Oregon State basketball games televised on cable. Jarvis was inducted into the State of Oregon Hall of Fame in 1987 and the Oregon State University Athletic Hall of Fame in 1991. Jacobsen, the first Cardinal player to be recognized as a First Team All-American by the Associated Press, was a three-time All-Pac-10 and two-time All-America selection in his three years with the Cardinal from 2000-02. His 1,723 career points rank fourth-best in school history while his scoring average of 18.1 points per game is sixth all-time. Jacobsen led Stanford in scoring three years in a row, including his junior season where he also led the Pac-12 in scoring, the first Cardinal to do so since Keith Jones in 1983-84. He was named Pac-10 Co-Freshman of the Year during the 1999-2000 campaign, averaging 14.5 points for the second-highest freshman total in school history. His sophomore year was highlighted by the AP First-Team All-America nod and second team All-America recognition by ESPN.com. Jacobsen also earned All-America accolades as a junior, where he shot at a .441 percentage and had a career-best 106 assists. He was drafted 22nd overall by the Phoenix Suns in the first round of the 2002 NBA Draft after foregoing his senior year, and played for three seasons with Phoenix. Jacobsen then played regularly for New Orleans and Memphis before electing to play oversees. 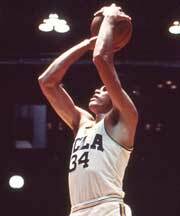 Meyers was a three-year letterwinner at UCLA who led the Bruins to two NCAA titles in 1973 and 1975. A two-year starter in the Bruins’ frontcourt, Meyers averaged 11.8 points in 89 career games, ranking 14th on UCLA’s all-time scoring list with 1,046 career points. He helped the Bruins post a perfect 30-0 record in the 1972-73 campaign en route to winning the NCAA Championship. As a junior in 1973-74, Meyers averaged 11.4 points per game in all 30 contests as UCLA finished third at the NCAA Tournament. Meyers and UCLA responded the next season with a 28-3 record and the program’s 10th NCAA title, which was also John Wooden’s final UCLA team. He picked up consensus first-team All-America honors as well as All-Conference accolades after averaging 18.3 points per game as a senior. Following his UCLA career, Meyers was chosen as the No. 2 overall selection in the 1975 NBA Draft by the Los Angeles Lakers, making him one of just six UCLA players to have been selected No. 1 or 2 overall in the NBA Draft. He played four seasons in the NBA for the Milwaukee Bucks before choosing to retire in 1980. Hannum was a four-year letterman for the Trojans, playing in the 1942-43 season then returning for three years from 1946-48. An All-Southern Division first-team honoree as a senior, Hannum also picked up team Most Valuable Player accolades after serving as team captain and averaging 11.4 points per game in his final season with USC. He was also a member of the 1943 conference-champion USC team. After leaving USC, Hannam played with seven teams in the National Basketball League and the NBA from 1949-57, but he found true success as a head coach. He led five different NBA teams (St. Louis Hawks, Syracuse Nationals, San Francisco Warriors, Philadelphia 76ers and San Diego Rockets) and two ABA teams (Oakland Oaks and Denver Rockets/Nuggets) over the span of 16 years. He remains the only coach in professional basketball history to win titles in both the NBA and ABA, picking up NBA titles in 1958 with St. Louis and 1967 with Philadelphia before winning the ABA championship in 1969. Hannum coached 12 future Hall of Famers en route to his induction into the Naismith Basketball Hall of Fame in 1998. He was the 1964 NBA Coach of the Year and 1969 ABA Coach of the Year, and was enshrined in the USC Athletic Hall of Fame in 2001. He passed away in 2002 at the age of 78. 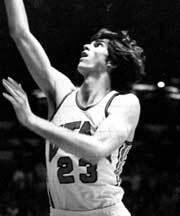 One of just seven players to have his number retired by the Utes, Vranes was an All-American in 1981 as well as a four-time All-Western Athletic Conference honoree and a member of Utah’s All-Century Team. He led the Utes to three NCAA Tournament appearances, including two Sweet 16s, in his tenure in Salt Lake City, going 86-31 overall and 44-12 in conference games. The Utes also won a WAC title his senior year and ended the season ranked 14th in the nation. He also played in the 1979 Pan American Games in San Juan, where he helped the United States win the gold medal. After college, Vranes was selected as the No. 5 overall pick in the 1981 NBA Draft by the Seattle Supersonics. He would go on to play seven seasons and was named to the All-Defensive Team in 1985. Vranes also played four years overseas in Greece and Italy. A four-year letterwinner for UW from 2005-09, Brockman is the current record holder for career rebounds with 1,238 boards, also posting 1,805 career points which is the third-best total in school history. He was the first Husky ever and fourth Pac-12 player to surpass 1,800 career points and 1,200 rebounds, and was the first player to lead UW in rebounding for four-straight seasons. 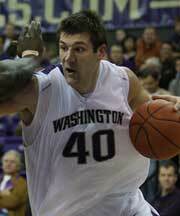 The 2009 Pac-10 Tom Hansen Conference Medal Winner, Brockman also was a two-time first-team All-District by Basketball Times, the NABC and the USBWA. He also picked up honorable mention All-America accolades as a senior, along with first-team All-Pac-10 honors. On the court, Brockman led the Huskies to their first outright Pac-10 title in 2007, and first outright championship in any league since winning the Pacific Coast Conference 56 years prior. The Huskies advanced to the Sweet 16 his freshman season and to the NCAA second round in his senior campaign. Brockman was selected as the 38th pick in the 2nd round of the 2009 NBA Draft by the Portland Trailblazers, and played with the Sacramento Kings, Milwaukee Bucks and Houston Rockets. 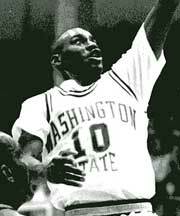 Seltzer spent four years at Washington State from 1989-93 and finished as the school’s career leader in three-point field goals made with 230, which also set a Pac-12 record. The four-year starter and three-time captain was an immediate contributor as a freshman, leading the team in assists with 114 and earning Pac-10 All-Freshman Team honors. He also led the team in assists as a sophomore, then followed with a junior season where he helped WSU to a 22-11 record, the most wins in nine years, and an NIT appearance. As a senior, Seltzer averaged 17.9 points, 4.0 rebounds and 4.7 assists to garner USBWA All-District 8 and All-Pac-10 First Team honors. 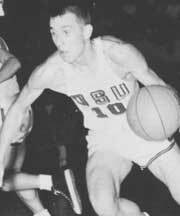 In addition to being the all-time leader in three-point field goals made and attempted, going 230-for-585 from beyond the arc in his career, Seltzer also closed his career third in scoring at WSU and first in assists, becoming the first player in school history to record four-straight seasons with 100-plus assists. Following his Cougar career, he spent four seasons playing professionally overseas before joining the coaching staff at Oklahoma. He spent nine years at OU, two at Marquette and four at Indiana before becoming the head coach at Samford from 2012-14.